As a corporate event photographer, I have a pretty standard setup that I take to each event I photograph. I typically use two lenses — my Panasonic 12-35 f/2.8 (equal to a 24-70) and Olympus 40-150 f/2.8 (equal to an 80-300). Then I have my flash, my MagMod MagBounce diffuser, and spare batteries. I take other lenses too, but 90% of the time, they sit in my bag and are maybe pulled out for just a few moments. With all this gear, it’s important to not let it weigh you down and to stay mobile. Using a combination of gear items helps me to achieve mobility when I’m on my feet, working the room. I start out with a lens switcher, enabling me to change lenses quickly and without having to go back to my bag. When I used my old Nikon D800, I used the Vello Rapid Lens Changer, which has versions for Nikon, Canon and Sony mounts. Since my switch to the Panasonic Lumix GH5, I’ve started using the Spider Camera Holster, which lets me carry a lens (or second camera body) around my waist. I typically keep my Nissin Di700A flash with my MagBounce on my camera at all times, even if I’m not using it. Early in my career, I found myself caught off guard by changing light conditions indoors that either wasn’t communicated by the client or that I wasn’t prepared to handle without a flash. Having all my gear accessible as things change throughout an event is important, as you don’t want to miss a key moment. In my pocket, I have a set of extra batteries — one for my GH5, and a set of four AA batteries for my flash. In terms of extra equipment, I keep that in my bag, which I try to keep close (but out of the way) of the action. Usually, I stash this under a registration table or keep it in the corner of a room where I can access it if necessary. Any bag will do, but I make sure to have a bag that will hold all of the necessary gear I have with me, even if I plan on wearing some of it. For me, that bag is Vanguard’s The Heralder 38 Bag. No matter what gear you have, the key is to stay mobile. You want to be there for every moment, and be quick on your feet. 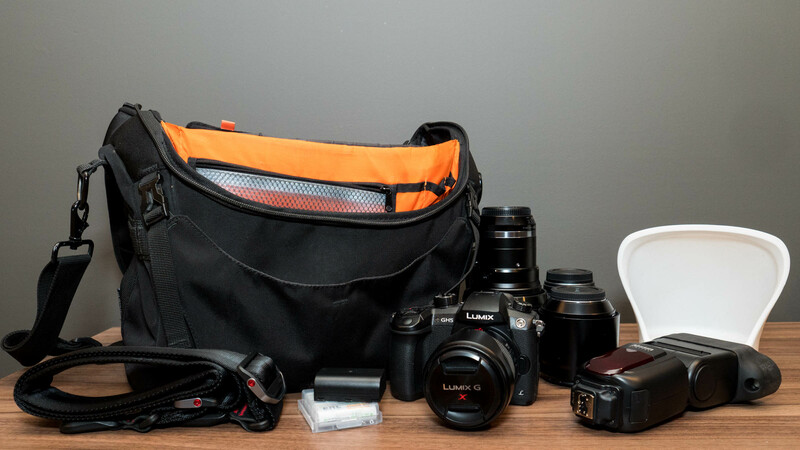 By having your essential gear with you at all times, you’ll be able to capture everything needed, and then some!